A company called Gamma International has suffered a serious security breach, resulting in hackers posting its confidential data on the web for anyone to download. You might think–there’s nothing so unusual in that. Organizations get hacked all the time. What makes things different on this occasion, however, is the particularly type of work that Gamma International does: it develops commercial network intrusion malware for the purposes of surveillance, and sells it to governments around the world. And, it has been claimed, authoritarian regimes in Bahrain, Egypt, Turkmenistan and Oman are amongst those who are using Gamma’s controversial FinFisher spyware. 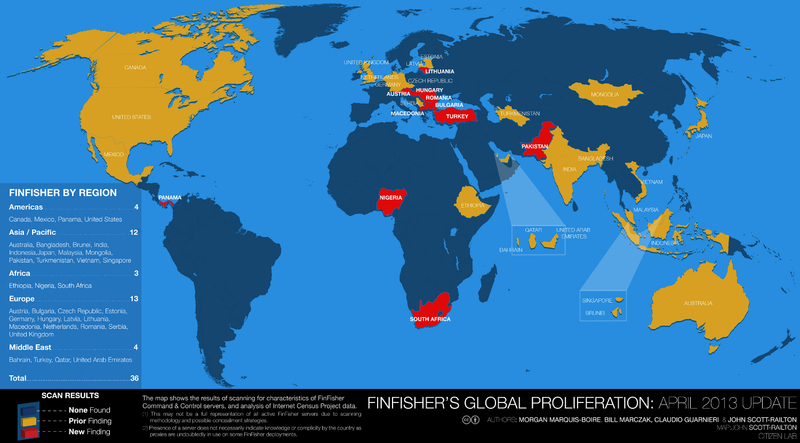 In 2013, Citizen Lab published a report claiming that 36 countries around the world were hosting FinFisher Command & Control Servers. The list of countries, which contains some who have a poor record for human rights and democracy, was: Australia, Austria, Bahrain, Bangladesh, Brunei, Bulgaria, Canada, Czech Republic, Estonia, Ethiopia, Germany, Hungary, India, Indonesia, Japan, Latvia, Lithuania, Macedonia, Malaysia, Mexico, Mongolia, Netherlands, Nigeria, Pakistan, Panama, Qatar, Romania, Serbia, Singapore, South Africa, Turkey, Turkmenistan, United Arab Emirates, United Kingdom, United States, and Vietnam. In April 2013, Gamma International’s antics raised the ire of Mozilla, developers of Firefox, after it was discovered that FinFisher had been deliberately disguised as the popular browser in an attempt to trick users into installing the malicious code. Mozilla said that it had seen evidence that the Firefox disguise had been used by FinFisher in a spyware attack in Bahrain aimed at pro-democracy activists during Malaysia’s General Elections, and in a promotional demo produced by Gamma International. The hacker then created a parody Twitter account (@GammaGroupPR) to highlight some of their findings, and–naturally enough–the attention of the media was easily drawn. As a result, the secrets of FinFisher (also known as “FinSpy”) are being revealed–pulling back the curtain on the mysterious malware that is used by governments and intelligence agencies across the globe to silently infect and remotely control computers, log keystrokes and snoop on video calls. Amongst the leaked documents published on the net are what appear to be authentic client records, manuals and brochures, price lists, source code and details of shady companies that have sold Gamma International exploits and zero-day vulnerabilities to sell on to others. Security researchers and privacy campaigners will no doubt enjoy sifting through the code and stolen information, perhaps turning a blind eye to the criminal act which saw the documents become public. I wouldn’t be shocked to see more revelations about FinFisher and its developer spilling out in the coming days. But one thing I suspect you may not hear is any word from the company which made the software.